Color change is one of the main features of an anterior restoration. You can generally assume a patient will request it. Because of this, success in this aspect of the restoration is critical to a patient’s perceived satisfaction with the result. 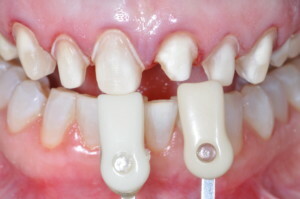 I’ve written recently about how to ensure success in anterior restorations. In these posts, I’ve gone over the pros and cons of minimal versus aggressive preparations. I also delved into the value of treatment planning and a useful approach to two common alterations. Now it’s time to really get to the heart of what patients want out of an anterior restoration: color change. Why is color change so important? Your patient may know next to nothing about occlusion or incisal edges, but they will be able to tell immediately if you improved the color of their teeth. This can be a good thing since it’s easier to demonstrate your dental chops in a way that the patient can easily judge. Or it can be a bad thing, if you find the pressure of achieving their ideal color overwhelming. If you can hone your skills here, you’re on your way to a clinically sound and aesthetically pleasing case. The patient’s teeth naturally vary in color. They want to remedy this for purely aesthetic purposes. They’ve used antibiotics that caused discoloration. A previous dental restoration left them discolored and frustrated. This last one adds even more pressure. You have to gain their trust. Show them what’s really possible with the right combination of skills and patient-centered treatment. If the alteration is small, you’re going to have an easier time of it. An alteration of less than two shades leaves you with a lot of flexibility. You can take a breath of relief and then dive right in to the preparation. A variety of appropriate materials. 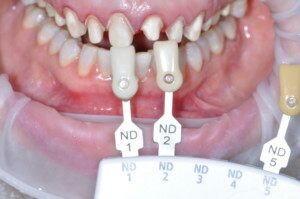 Leave the margins equigingival (this will make accurate impressions easier and aid in postoperative oral hygiene). But what if the color change is more than two shades? You’re in for a more complicated preparation, but all hope is not lost. In my next post, I’ll show you how to alter the preparation to reach a result that you and your patient can smile about. We don’t want predictability to suffer! Do you find color change enjoyable or frustrating during anterior restorations? Let us know in the comments!